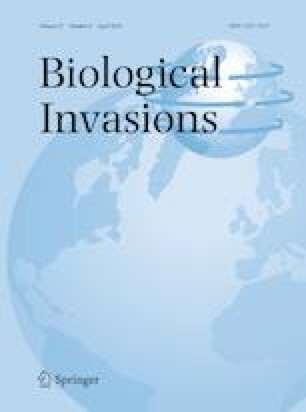 Several plant traits have been linked to invasion success in studies involving single alien species or invaded versus non-invaded communities. Less consideration has been given to how invasion by multiple alien species changes community-wide traits and functional structure at landscape scales. Changes to community functional structure by multispecies invasion may have consequences for ecosystem function. Therefore, it is important to identify which traits of naturalized aliens are responsible for optimizing patterns of trait convergence and divergence. Here, we examine if invasion by multiple alien species is related to changes in community-wide functional traits, and patterns of trait convergence and divergence, across an invasion gradient. We collected field data in Victoria, Australia, on traits previously associated with invasion success from 15 × 500 m2 plots. These plots encompassed a range of relative alien cover (~ 3–61%) and represented a multispecies invasion gradient. We tested relationships of each trait to the invasion gradient. We also determined trait convergence and divergence patterns across the gradient, using a trait divergence analysis. Specific leaf area and proportion of annual species significantly increased with the level of invasion. Annual life history and flowering duration maximised trait-convergence, but the two traits had different relationships to the invasion gradient. Specific leaf area, annual life history, leaf dry mass and seed mass maximised trait divergence. Evidence of trait-divergence along the gradient is represented by an increase in functional diversity with invasion level. However, variation in functional diversity was higher in little-invaded communities and stabilised at intermediate and high levels of invasion. Traits (specific leaf area and annual life history) associated with invasion success at a landscape scale are traits promoting rapid life cycle completion, and increases in multispecies invasion leads to an increase in functional diversity but a decline in its variation. The online version of this article ( https://doi.org/10.1007/s10530-018-1883-0) contains supplementary material, which is available to authorized users. This research was supported by the Australian Research Council Discovery Project (DP150103017), an Australian Government Research Training Program (RTP) Scholarship and Parks Victoria Research Partner Program Grant no. RPP1314P13. We thank Parks Victoria for assisted access to the field area (Permit Number 10007007a). We thank Gillis Horner for field and laboratory assistance, and Ros Gleadow, David Baker, Cath Dickson and Marie Henriksen for their helpful comments on improving the manuscript.